Amphibious. The gulper can breathe air and water. Pounce. If the gulper moves at least 20 feet straight toward a creature and then hits it with a claw attack on the same turn, that target must succeed on a DC 10 Strength saving throw or be knocked Prone. If the target is Prone, the gulper can attempt to grapple it as a bonus action. Multiattack. The gulper makes two attacks with its claws and one with its bite. Claws. Melee weapon attack: +2 to hit, reach 5 ft., one target. Hit: 2 (1d4) slashing damage. Speed 40 ft., climb 20 ft., swim 40 ft.
Pounce. If the gulper moves at least 20 feet straight toward a creature and then hits it with a claw attack on the same turn, that target must succeed on a DC 11 Strength saving throw or be knocked Prone. If the target is Prone, the gulper can attempt to grapple it as a bonus action. Multiattack. The gulper makes two attacks with its claws, one with its bite, and one with its tail. Claws. Melee weapon attack: +3 to hit, reach 5 ft., one target. Hit: 4 (1d6 + 1) slashing damage. Tail. Melee weapon attack: +3 to hit, reach 5 ft., one target. Hit: 3 (1d4 + 1) bludgeoning damage, and the target must succeed on a DC 11 Strength saving throw or be knocked Prone. Pounce. 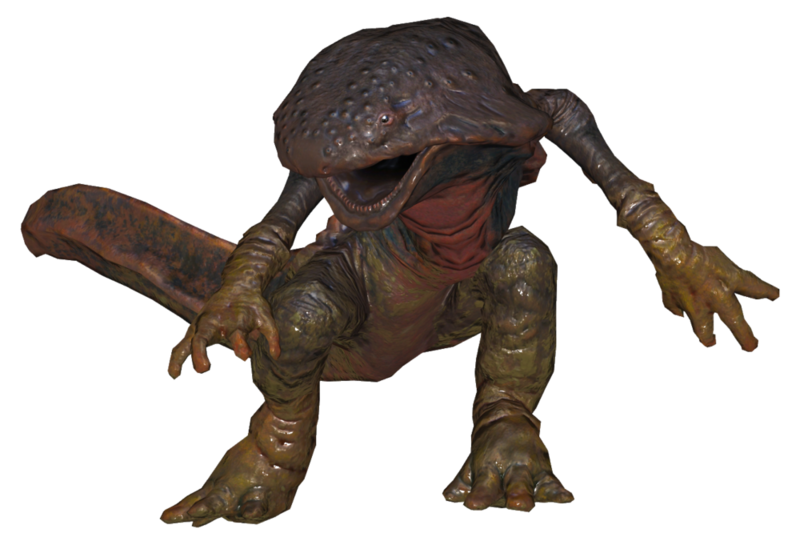 If the gulper moves at least 20 feet straight toward a creature and then hits it with a claw attack on the same turn, that target must succeed on a DC 13 Strength saving throw or be knocked Prone. If the target is Prone, the gulper can attempt to grapple it as a bonus action. Claws. Melee weapon attack: +5 to hit, reach 5 ft., one target. Hit: 9 (2d6 + 2) slashing damage. Tail. Melee weapon attack: +5 to hit, reach 10 ft., one target. Hit: 7 (2d4 + 2) bludgeoning damage, and the target must succeed on a DC 13 Strength saving throw or be knocked Prone. Pounce. If the gulper moves at least 20 feet straight toward a creature and then hits it with a claw attack on the same turn, that target must succeed on a DC 15 Strength saving throw or be knocked Prone. If the target is Prone, the gulper can attempt to grapple it as a bonus action. Radioactive Glow. The glowing gulper sheds bright light in a 20-foot radius and dim light for an additional 20 feet. Claws. Melee weapon attack: +7 to hit, reach 5 ft., one target. Hit: 9 (2d6 + 2) slashing damage and 7 (2d6) radiation damage. Bite. Melee weapon attack: +7 to hit, reach 5 ft., one target. Hit: 11 (2d8 + 2) piercing damage and 7 (2d6) radiation damage. Tail. Melee weapon attack: +7 to hit, reach 10 ft., one target. Hit: 7 (2d4 + 2) bludgeoning damage and 7 (2d6) radiation damage, and the target must succeed on a DC 15 Strength saving throw or be knocked Prone. Pounce. If the gulper moves at least 20 feet straight toward a creature and then hits it with a claw attack on the same turn, that target must succeed on a DC 18 Strength saving throw or be knocked Prone. If the target is Prone, the gulper can attempt to grapple it as a bonus action. Multiattack. The gulper makes four attacks with its claws, one with its bite, and one with its tail. Claws. Melee weapon attack: +10 to hit, reach 5 ft., one target. Hit: 11 (2d6 + 4) slashing damage. Bite. Melee weapon attack: +10 to hit, reach 5 ft., one target. Hit: 13 (2d8 + 4) piercing damage. Tail. Melee weapon attack: +10 to hit, reach 10 ft., one target. Hit: 9 (2d4 + 4) bludgeoning damage, and the target must succeed on a DC 18 Strength saving throw or be knocked Prone.